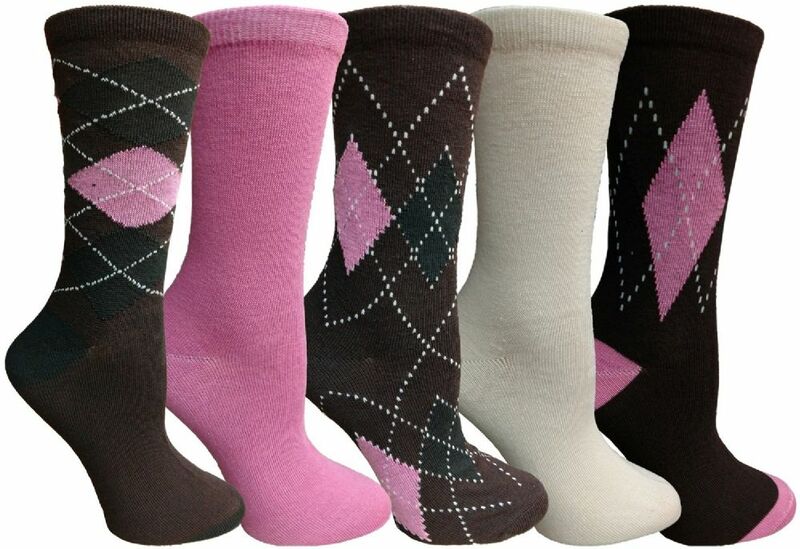 Yacht&Smith 5 Pairs of Womens Crew Socks, Fun Colorful Hip Patterned Everyday Sock (Assorted Argyle E) at low wholesale prices. Socksinbulk.com offers Womens Crew Sock at bulk discounted prices. Looking for crew socks to wear every day? Look no further, these assorted packs are sure to add some color to any outfit. Whether youG re looking to wear it to the gym, for a stroll, to the mall, or for any other activity, these socks will become your go-to socks. Choose from crazy patterns, to cute prints, to something modern. Look great in a wide variety of outfits and wears well with jeans, shorts, sweat pants, shoes, boots, or sneakers. Ideal for wearing to work, cycling, jogging, and more. Being fashionable and comfortable at the same time, these socks feature a soft texture for additional comfort at the feet while allowing it to breathe and stay cool. With these uniquely designed patterns, these socks are also great for wearing indoors without shoes. Sock size 9-11 will fit womenG s shoe sizes 5-10. Welcome to the ultimate women's crew socks selection, where you can choose from a wide selection of crew socks that you won't find anywhere else. Our uniquely designed patterns feature styles for every personality and mood of the day. Whether you want something funky, modern, or classic, these are 5 pack assorted crew socks that you don't want to miss. Choose from a wide range of patterns including unicorns, foods, stripes, polka dots, diamonds, emojis, and so much more. Many of these fun and funky colorful styles are perfect for wearing with shoes, sneakers, or boots. Or if you want something trendy, but a little less out there, choose from many modern patterns including colorful space dyes. Crew socks are the perfect everyday socks and goes with a wide range of outfits. Whether you're sporting jeans, a skirt, shorts, sneakers, boots, or shoes, these socks can easily be your go-to socks all year round. Whether you're going to work, taking a stroll, or hanging out with some friends, you can show off your trendy socks. Designed not only to be stylish, but to be comfortable as well. Made with a selection of fine fibers, these socks ensures that your feet are properly cushioned and stays cool throughout the day. If you play sports and get active in crew socks, these breathable crew socks are the perfect match for you. SATISFACTION GUARANTEED: Buy with confidence and get a 30-DAY MONEY BACK GUARANTEE. If you are not satisfied with our socks, please contact us and we will respond within 24 hours. Your satisfaction is our top priority. Sock size 9-11 will fit women's shoe sizes 5-10 (US).